Don’t Let Anyone Ever Dull Your Sparkle | Just Jess Fashion! Every now and then a graphic tee says everything I need to say. I mean how cute is this? I actually saw this top on a blog and immediately dashed out to my local Kohls to get it. Every now and again I stumble in there and I’m always shocked at how many cute things I find. Typically, my curiosity leads me to the LC Lauren Conrad collection. Occasionally I find some really cute pieces on clearance too! I would never pay full price for that stuff though. $40 for mass produced polyester. No thanks. Some people eat Wheaties for breakfast, but me? I prefer sparkly things. OK, not really. 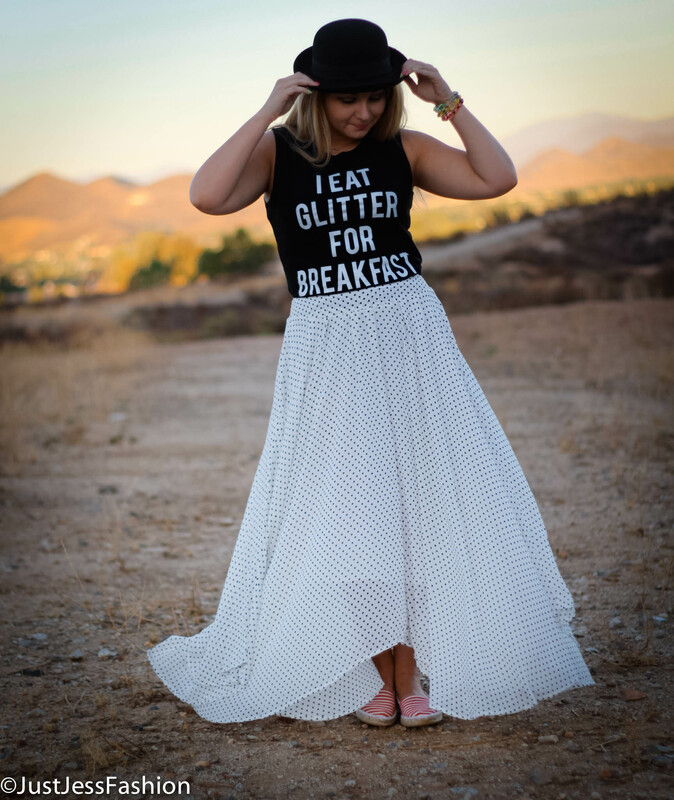 But how cool would it be to have breakfast covered in edible glitter (which to whoever invented that, I applaud you. Standing ovation!) Yup, I am that girl. If I could have a hot pink car with a Swarovski encrusted license plate I would. Hey my nick names aren’t Barbie and Sharpey Evans for nothing! I decided long ago that life is too short not to live it in color. Or better yet sparkles! Pet peeve though. Have you ever noticed how incredibly frustrating it is to invest in sparkly pieces? It’s almost as rare as finding a vintage Chanel piece in a thrift shop in the middle of nowhere to find a piece of clothing whose sparkle survives the first wear. But hey there’s something epic to be said about a girl who lives glitter in her path. I will always have a twinkle in my eye for things that glimmer and shimmer. And there’s nothing backup sequins and rhinestones can’t fix. However, take it from me the best sparkly things to invest in are shoes and accessories. What a coincidence! Two of my favorite things! One of my biggest regrets in life is passing on a pair of hot pink suede Jimmy Choo platform heels whose soles were covered in hot pink Swarovski crystals. Hmm…maybe I make my own! Love the skirt and hat and yes even the shirt!! 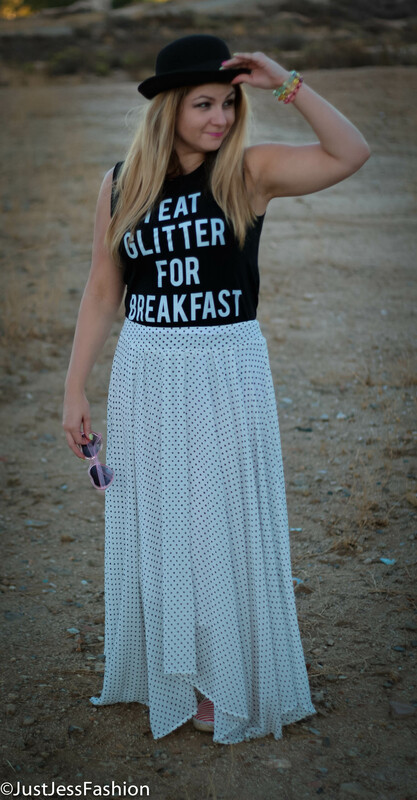 And I know you would eat edible glitter sprinkles anything for breakfast!!!! It’s Just Jess as the blog states. The Jess I love!!! Have a terrifically sparklerific day!! I Heart you! !